Programs are free for museum members and included with admission for visitors, unless otherwise noted. To see a complete listing of the JANM’s programs, visit janm.org/events. Members at the Sustaining Level and above are invited to preview Kaiju vs Heroes: Mark Nagata’s Journey through the World of Japanese Toys before it opens to the public. See hundreds of dazzling vintage and contemporary Japanese vinyl toys, providing a feast for the eyes and the imagination. Program with a light reception to follow. Invitations were mailed in early August. Kaiju translates to “strange creature” in English but has come to mean “giant monster” referring to the creatures like Godzilla and Mothra that inhabited the postwar movie and television screens of Japan. The advent of these monsters brought about the creation of characters to combat them—hence the emergence of pop-culture heroes like Ultraman and Kamen Rider. Immerse yourself in a colorful universe of vintage and contemporary kaiju and hero toys from Mark Nagata, a toy designer and fervent toy collector. RSVP by September 12 using the link below. You can also contact memberevents@janm.org or 213.830.5646. In conjunction with the opening of Kaiju vs. Heroes, toy designer and collector Mark Nagata and Marusan toy company President Eiji Kaminaga will participate in a discussion about kaiju toy history, the world of Japanese toy collecting, and their companies’ histories (Nagata is the founder of Max Toy Company). The Marusan toy company created some of the first vinyl kaiju and hero toys of the 1960s and these toys make up a significant part of Nagata’s collection. The conversation will be moderated by Brad Warner, who worked for 15 years at Tsuburaya Productions, the makers of the Ultraman television shows. Warner is now an author and teacher of Zen Buddhism. Following the discussion, Mark Nagata will sign copies of Toy Karma, an accompanying book by and about Nagata, as well as a 13" x 19" print (10" x 17" image size) featuring a kaiju and hero image by toy photographer Brian McCarty, who will also be signing the print. The book is $24.95 and the print is $50. Both can be purchased the day of the event. In conjunction with the Kaiju vs Heroes exhibition, artist Mark Nagata will be coming to JANM to continue painting an Eyezon kaiju sculpture made by Toy Art Gallery. He will also sign books and other items. 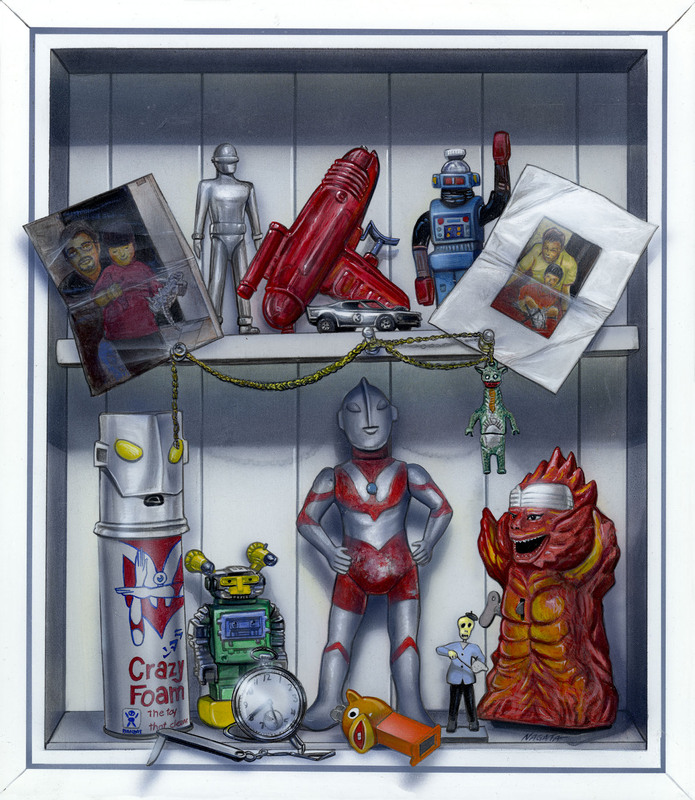 Arrive early to check out Kaiju vs Heroes: Mark Nagata’s Journey through the World of Japanese Toys before the movie! Free admission to JANM from 5 p.m.–8 p.m., with last admission at 7:30 p.m. There will also be food and music beginning at 6 p.m. Popcorn will be available for purchase by Buttery Popcorn Co. and food by Takuma’s Burger. A limited number of chairs will be set up, available first-come, first-serve. Guests are welcome to bring their own chairs and blankets, but please be mindful of blocking others’ views of the screen. 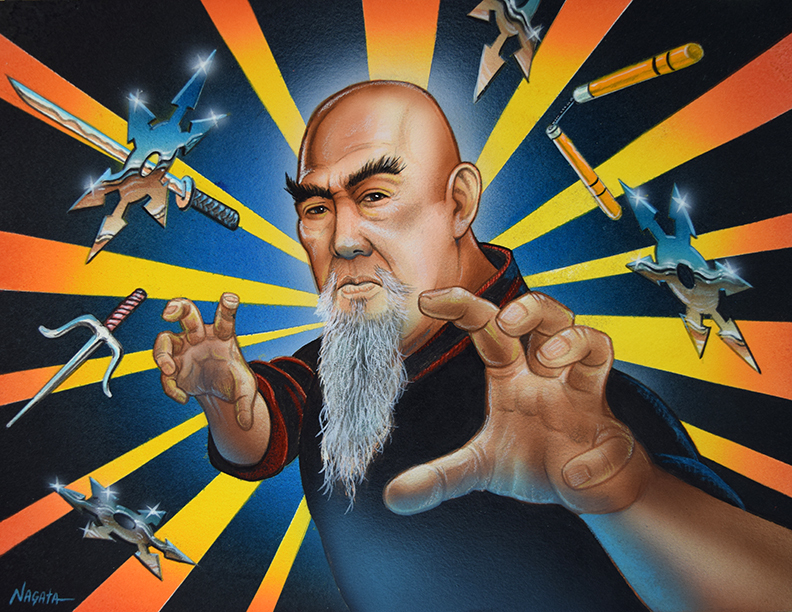 This full day of crafts, performances, and other activities will be inspired by real-life heroes as well as the fictional characters of Kaiju vs Heroes: Mark Nagata’s Journey through the World of Japanese Toys. Superhero Capes: Attention all crime-fighting kids and their grown-up sidekicks! Make your own superhero cape and unleash your hidden powers. Superhero Masks: Keep your secret identity under wraps with a handcrafted hero- or kaiju-inspired mask. Ruthie’s Origami Corner: Fold an Ultraman superhero! Superhero Selfies: Grab your cape and mask, strike a powerful pose, and snap a selfie in your new super outfit! Selfie sticks provided by JANM for this activity. Save a Life with A3M: Become a real hero by seeing if you’re a bone marrow donor match. Asians for Miracle Marrow Matches (A3M) focuses on recruiting marrow donors in ethnic communities because the odds of finding a match is much more likely within one’s own racial or ethnic group. Veterans Day Letters: Write a letter of appreciation to a veteran, to be delivered by Operation Gratitude. It only takes a few minutes to write a letter, but it will bring lasting joy to the person who receives it! Our friends from Terasaki Budokan will help kids transform basketball fun into fantastical feats of physical fitness worthy of free prizes. Run at the speed of light, fly to slam dunk, make jaw-dropping no-look passes, and sink amazing far-away shots. Watch yourself be turned into a superhero with a caricature drawn by an artist from Taylor Entertainment. For children only. Line ends at 2:30 p.m. Express line for members. November 25 is the second annual Museum Store Sunday! We join over 700 museum stores from all fifty states, ten countries, and three continents to provide a special shopping experience. Author Steve Ryfle will be at JANM to sign copies of his book Ishiro Honda: A Life in Film, From Godzilla to Kurosawa. Join us for some kaiju-themed refreshments! Ishiro Honda was arguably the most internationally successful Japanese director of his generation, with an unmatched succession of science fiction films that were commercial hits worldwide. With Godzilla (the first kaiju), Mothra, Rodan, The Mysterians, King Kong vs. Godzilla, and many others, Honda’s films reflected postwar Japan’s real-life anxieties and incorporated fantastical special effects, a formula that appealed to audiences around the globe and created a popular culture phenomenon that spans generations. Authors Steve Ryfle and Ed Godziszewski shed new light on Honda’s work and the experiences that shaped it—including his days as a reluctant Japanese soldier, witnessing the aftermath of Hiroshima, and his lifelong friendship with fellow filmmaker Akira Kurosawa. Ishiro Honda: A Life in Film, From Godzilla to Kurosawa is available at the JANM Store. Visit museumstoresunday.org to find other participating museums.